Okinawa’s golf sweetheart soared into high gear this week, breaking records enroute to earning her LPGA Card on the professional circuit. 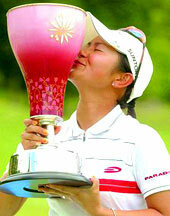 Ai Miyazato destroyed a years-long record by 12 strokes to win the qualifying tournament at Daytona Beach, Florida. The Higashi Village, Okinawa native turned professional two years ago, and has this year captured six tournaments in Japan while pocketing more than Y200 million in prize money. The 20-year-old sensation is abandoning the Japan Ladies Professional Golf Association Tour to try her hand in America, saying she intends on playing both in the U.S. and Japan. Miyazato has already bought a condominium in California, saying she intends on spending time with the world’s best players. She finished the qualifying tournament with a 17 under par 343, 12 shots ahead of Libby Smith and Lee Ann Walker-Cooper. It was the largest victory spread since the LPGA Qualifying School opened in 1973.